In this article, I’ll show you how to build a leaderboard for a simple game that updates in realtime after every round. You can find the entire source code of the application in this GitHub repository. Leaderboards are a feature in many online games which is used to improve competition among players since it gives them instant feedback on their rankings which tends to increases gamer satisfaction and keeps them playing for longer. To get started, install preact-cli globally with npm as we’ll be using it shortly to bootstrap a new Preact application. Once the installation completes, the preact command will become available on your machine. Run the following command in the terminal to create a new Preact app. This command creates a new folder called leaderboard in your working directory and installs all the necessary dependencies needed to build and run the application. As soon has the command has finished running, cd into the leaderboard directory and run npm run start to start the development server. The application should be viewable at http://localhost:8080. If port 8080 is not available on your machine, preact will provide another port for you to use. 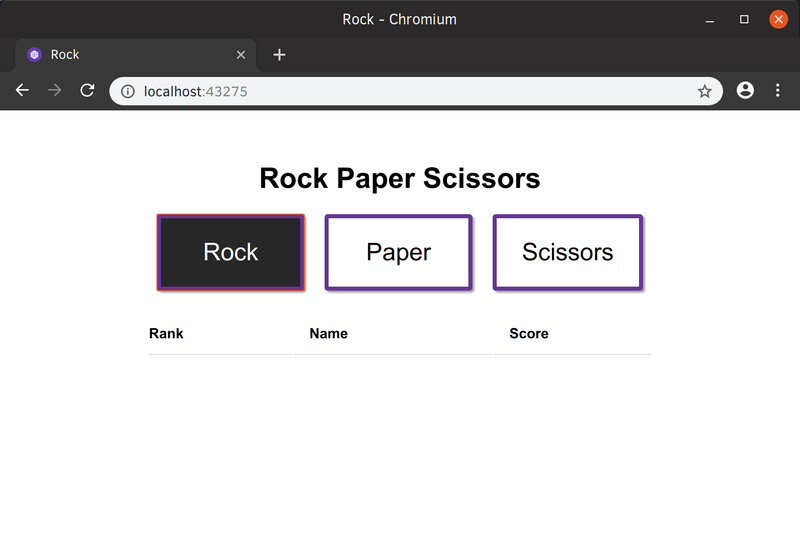 The game we will be making is the classic rock-paper-scissors game which is quite popular in many parts of the world. If you’re not familiar with the rules, you can check this Wikipedia entry to get up to speed with how the game works. In our implementation of the game, the player will get three points for a win, one for a draw and no points for a defeat. The score, as well as the player’s position on the leaderboard, will be updated in realtime. const computerPicked = computerPick ? message = result === 1 ? The three buttons allow us to select rock, paper or scissors for a round, while the table below it will contain the top scorers including the current player. We also have a message section where the winner of a round will be declared (if any). Let’s set up a simple Express server to handle how the score is determined for a round while also broadcasting updates to the frontend. Head over to the Pusher website and to grab the necessary credentials. Once you have signed up, select Channels apps on the sidebar, and hit Create Channels app to create a new app. We’re going to pretend that we have a leaderboard already with the scores of previous players. Normally, you’d fetch this data from the server, but in this scenario, we’ll hardcode the values in a JSON file. When our application loads, we need to update the table with the existing leaderboard values as shown in the leaderboard.json file. In the index.js file, we have a handleClick function that is invoked when each button is clicked. This function sends whatever value is clicked to the server through the /play endpoint. But this endpoint does not exist on the server yet so we’ll go ahead and create it in the next step. The compare function checks what the user plays (choice1) and compares it with what the computer picks (choice2) to determine a winner. As explained previously, the user gets three points for a win, one for a draw and zero points for a defeat. The computer picks a random value from the arr variable anytime this route is hit. This value is then compared with whatever the user selected and the resulting points value for the user is stored in the points variable. When the user scores a point, we need to update the leaderboard in realtime so that the player can see his progress in the rankings while playing the game. We’ll be making use of Pusher Channels to achieve this functionality. Let’s install the Pusher client library through npm. This is how we’ll use Channels in our Preact app. Next, we’ll open a connection to Channels within componentDidMount() and use the subscribe() method from Pusher to subscribe to a new channel called leaderboard. Finally, we’ll listen for the update on the bot channel using the bind method and update the application state once we receive a message. Don’t forget to replace the <your app key> and <your app cluster> placeholder with the appropriate values from your Pusher account dashboard. Finally, we’ll trigger updates from the server when the user’s points for a round have been determined. You can start the server by running node server.js in a different terminal window, and test out the game by playing a few rounds. You should see the leaderboard update as you score some points! I’m sure you’ll agree that setting up Pusher Channels for realtime updates to the game leaderboard was easy enough. There’s so much more you can do with Channels so I recommend digging into the docs to find more about the service and other awesome features it has. Thanks for reading! Remember that you can find the source code of this app in this GitHub repository.